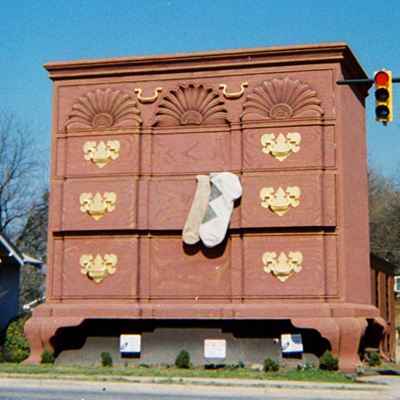 The World’s Largest Chest of Drawers pays tribute to High Point’s furniture industry. It was originally built in 1926 and later remodeled in 1996 at a cost of $100,000. The attached building behind the drawers serves as office space, formerly home to the High Point Jaycees. The socks hanging from the middle drawer serve as symbols of the city’s hosiery industry. The chest is 40 feet tall, and the socks are 6 feet tall. The original chest stood 32 feet tall, 14 feet deep, and 27 feet wide. The original 1926 bureau contained an inscription of the names of the local men serving overseas in the military. "Big Dresser," "Bureau of Information"
The Chest of Drawers was remodeled in 1996 into the Queen Anne style chest that exists today. The remodeled version was designed by Sid Lenger. Tate Park, at the corner of Main St. and Church Ave. The attached building has served as office space for several tenants throughout the years, including the High Point Jaycees. Additionally, private owners use the space for events such as banquets and meetings.